Working In a Team, has it’s own challenges. Especially sharing and managing Code Snippets! We need a Managed & Secure Access to frequently used code snippets. As the Enterprise or within the Team, one has to ensure the confidentiality of code snippets. And, As a developer, it is important to find the right code snippet, at the right time. We, as developers, tend to keep on searching code snippets while implementing a given functionality, which we ourselves would have created in past. And so, we believe that a centralized Code Snippet Manager can help to code efficiently. However, the library has to be secure, in order to protect what we develop! And so, we present jSnippy. 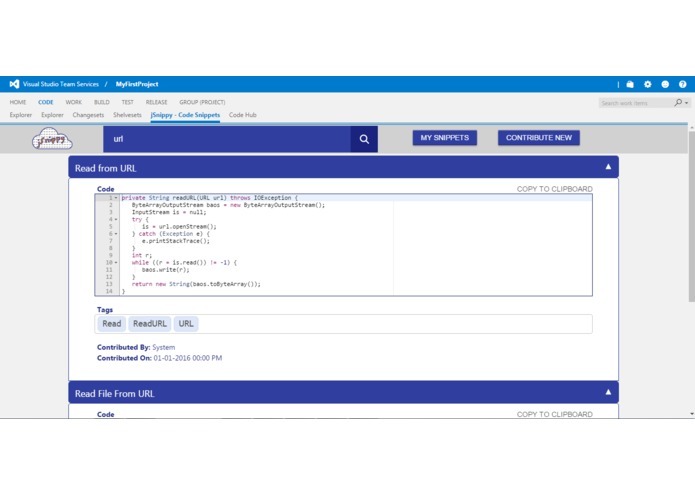 Your Code Snippet Manager, right within Your Visual Studio Team Services. jSnippy is your Code Snippet Manager for your Team, which manages Code Snippets for your team in a secure manner and with an easy to search interface. Get the Right piece of Code, at the right time. As a team member, you can contribute by creating Code Snippets to the repository. 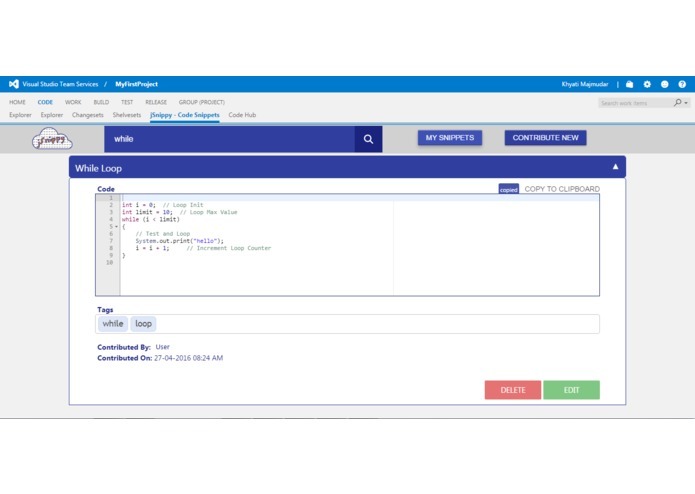 jSnippy provides an Editor to write your code in, with in-built Java language syntax highlighting. 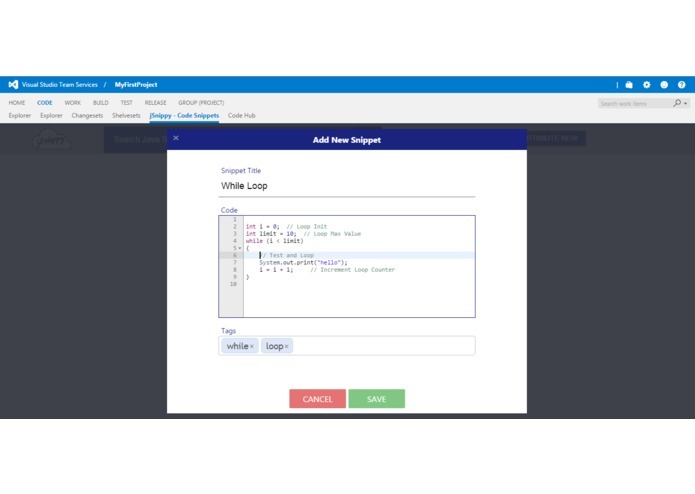 Your team members can easily search for Code Snippets through a powerful tag and full text search based search engine, and use them in their modules. That's how coding gets easier...! For Java based Teams, jSnippy also provides an option to import commonly used code snippets on first time load. Start using snippets out of the box. Private Repository of Code Snippets. Your code, stays with you! Data is stored within your VSTS account's data storage and so does not go out of it. jSnippy is available as a Hub under the 'Code' Hub Group, right within Visual Studio Team Services. Install jSnippy from Visual Studio Market Place, into your VSTS Account. Login to your project. 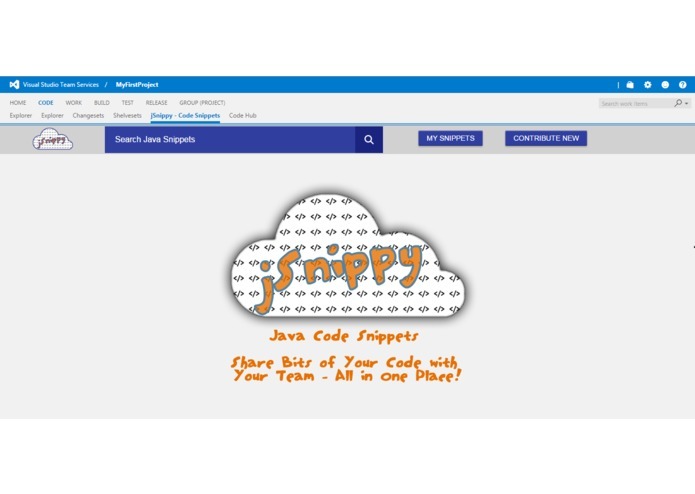 Navigate to 'Code' Hub Group and then to 'jSnippy - Code Snippets'. On First Load, jSnippy will ask you if you want to import default Snippets for Java. Click 'Import' to import, or 'Cancel' if you wish to proceed without any default Java Snippets. To contribute Snippets, click on 'Contribute New' on the Top Navigation Bar. This will open a Dialog to enter Title, Your Code and Tags. Save it to store in the repository. To View Snippets contributed by you, click on 'My Snippets' on the Top Navigation Bar. You can Edit or Delete Snippets contributed by you. To Search Snippets available in the repository, enter your Search Term in the Search Control on the Top Navigation Bar. This will return the results, from where you can copy the code snippet to clipboard by clicking 'Copy To Clipboard'. Creating Extensions for Visual Studio Team Services using VSTS SDK and REST API, can really help the developers to work in an efficient manner.